Welcome - Joanna Campbell SlanJoanna Campbell Slan | A place to meet, share, and inspire. 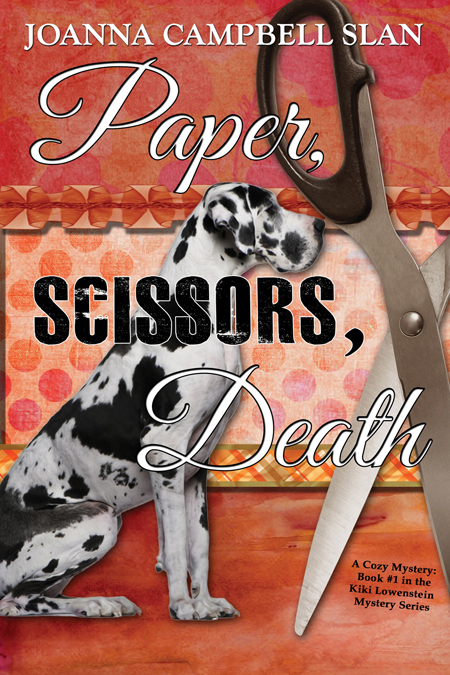 Coming this fall—Paper, Scissors, Death as an audiobook! Click "Read More" to hear a message from the narrator, Nicole Blessing! Thanks for visiting the official website for National Bestselling Author and Winner of the 2013 Daphne du Maurier Award of Excellence, Joanna Campbell Slan. Here you will find everything about Joanna–all the books, short stories, miniatures, coloring pages, pictures of her life, and scrapbooking gems she has to offer. Don’t forget, you can contact Joanna at JCSlan@JoannaSlan.com or interact with her on her Facebook page. Like to color? Join us at Joanna’s Coloring Club! "St. Louis visitors can avoid awkward conversations with locals by adding the following slang phrases to their repertoires..." Joanna teaches us all about St. Louis Slang! Don't miss Joanna's latest interview on The Business Blast Podcast! See Joanna's interview on PBS! Comment on Larissa's visit and you could win a digital copy of 15 MINUTES. I'll chose a winner next Friday, Oct. 20, 2017.